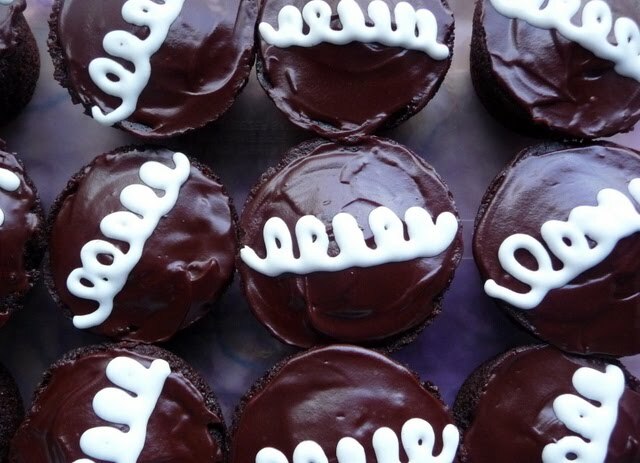 These are chocolate crème filled cupcakes a.k.a look-a-like Hostess Cupcake a.k.a. Faustess Cupcakes. I’ve had this recipe saved for a while now and finally decided to make them for my husband to give away. :) But actually I did get to try one – I like to at least try everything I make – because otherwise I wouldn’t know if I liked it. I only blog about recipes that I want to remember in the future – and well – these are one of them. The cake was super moist and delicious and the chocolate ganache was perfect – not too hard but not too soft either. 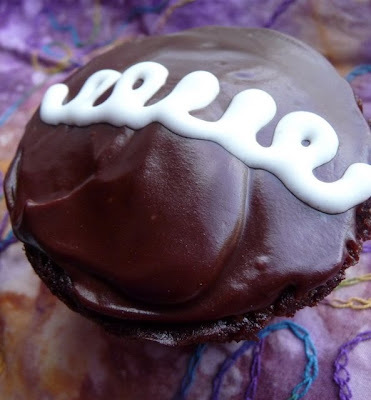 The marshmallow filling was used both inside the cupcake and to make the squiggly line on top. 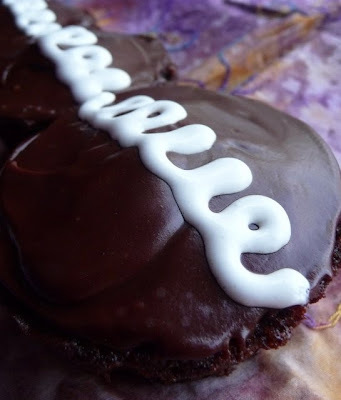 I can’t really say how they compare to Hostess – since I could not tell you the last time I had a real Hostess cupcake (maybe 15-20 years ago?!) – but they were a delicious, fulfilling dessert – and that is all that really matters anyway! Enjoy! 1. Adjust oven rack to middle position and heat oven to 325 degrees F.
2. Grease and flour 12-cup muffin tin. 3. Combine flour, baking soda and salt in a small bowl. 4. In a large bowl, combine the water, cocoa, chocolate chips, and espresso, until smooth. Add in sugar, sour cream (or yogurt), oil, eggs, and vanilla and mix until combined. 5. Whisk in flour mixture just until incorporated. 6. Divide batter evenly among muffin cups. Bake for 18-22 minutes until a toothpick inserted in the center comes out with just a few dry crumbs. Cool in pan for 10 minutes, then cool completely on a wire rack. 7. To make filling. Combine water and gelatin in a large bowl and let sit until softened, about 5 minutes. Microwave for about 30 seconds, until mixture bubbles around edges and gelatin dissolves. Stir in butter, vanilla and salt until combined. 8. Let mixture cool until warm to the touch and mix in marshmallow crème until smooth. Refrigerate until set – about 30-40 minutes. 9. Once set, transfer 1/3 cup to a pastry bag fitted with a small, plain tip. Reserve remaining for filling cupcakes. 10. To assemble cupcakes. Microwave chocolate and butter in a small bowl, stirring occasionally, until smooth – about 30 seconds. Cool to room temperature – about 10 minutes. 11. Insert the tip of a paring knife at a 45 degree angle about 1/4 inch from the edge of the cupcake. Cutout and remove the cake cone. 12. Cut off all but the top 1/4 inch of the cake cone, leaving a circular disc of cake. Discard (eat) the bottom of the cone. 13. Using a spoon, fill each cupcake with the marshmallow mixture and then top with the reserved cake top. 14. Spread the glaze over the top of the cupcake. Once the glaze has set – pipe on a curlicue using the reserved marshmallow filling. Yum! I'm sure these are WAY better than Hostess! I can't get over how PERFECT these look! I need to try sometime!